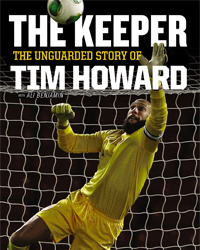 The hero of the 2014 FIFA World Cup, U.S. goalkeeper Tim Howard shares his inspiring personal story in this all-new memoir, being released just in time for the 2014 holiday season. In the Young Readers' edition, Howard talks openly about the lessons he learned from his hard-working single mother, and his grade-school battle to overcome Tourette's Syndrome and become a global soccer superstar. 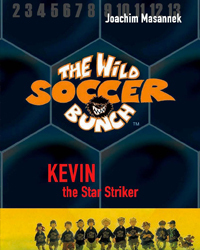 One of the most popular soccer-themed young reader series of all-time, The Wild Soccer Bunch kicks off with the tale of Kevin, the star striker, who -- along with his rag-tag group of nine-year-old friends -- wants to take back their favorite field from the older bullies who call themselves The Untouchables. Young readers will learn about the importance of friendship, teamwork, discipline (even when members of The Wild Soccer Bunch find themslves grounded!) and diversity, all in the context of a fun soccer story they'll be reading well past bedtime! 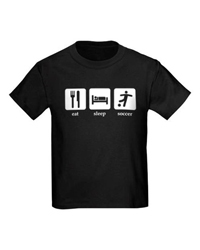 Show your soccer spirit at school, at practice, or just lounging around the house in this cool t-shirt by Hanes. Available in multiple colors and styles (even onesie-sized), it's a great gift for anyone who truly lives soccer. Want to play soccer on a cold, rainy winter day — or maybe on the school bus, on an airplane or even at the dinner table? StrikerZ is a soccer card game that simulates real game action -- draw cards to build your team, then take a shot at your opponent's goal. 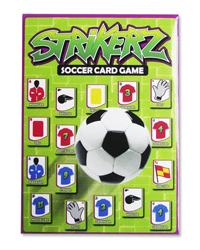 A fun, easy-to-learn, and quick-to-play game featuring just enough strategy -- including red cards, yellow cards, substitutions and more -- to make repeat plays interesting, StrikerZ is an excellent stocking stuffer for any young soccer enthusiast. Scarves up! 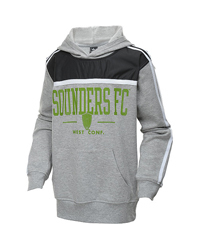 Show off your Seattle Sounders FC spirit with this hoodie, perfect for wearing to the Sounders' 2015 season home opener in March. Can't decide? No problem! Pick up a gift card to Schmetzer's Sporthaus, the Seattle-area's No. 1 source for soccer gear and apparel for more than 35 years. With locations in Seattle, Everett and Redmond, the family-run business — founded by Walter Schmetzer, whose two youngest sons, Andy and Walter, Jr., run the business today while oldest son Brian coaches for Sounders FC -- is sure to have whatever the soccer fan in your life is looking for.